When my wife & I arrived in Seattle recently, we rented a car from Avis. After an exhausting re-route to a different counter than the one conveniently located beside the baggage claim area and a long, long wait to get a car (geez, what do most people do at the rental counter? I just say "rent me what I ordered, I don't want an upgrade and no I don't want insurance") we got to our 2009 Altima. Now I am not into cars. Except for a brief stint as a teenager tricking out my Camaro with Keystone Classic chrome wheels and hosing down the glass-pack mufflers to make it sound really loud I have mostly settled for "cheap & paid for". So when I was confronted with "keyless ignition" I was frankly baffled. Here is what would have been the key. So I pushed the Start/Stop button. Hmmm. ACC. Ok, accessories are now on. Radio, etc. So I need to push it one more time. It says "On". Right. But the engine is not on. Just the stupid "On" light is on. Ah. Maybe I need to hold it down at this point to get the engine to start. Back to square one! Defeat. Deflated. Ok, so now I do what every user does when faced with something that didn't work. I do all of the steps again. And again. Now I know better. But still I keep cycling through Off-Acc-On-Off again and again. I look around the car. Checking out the dash. I look to the left side of the dash. Ah. Maybe I need to buckle my seat belt... Nope that did not do it. I see the Brake indicator. Take off the emergency brake? Nope that did not do it either. By this time I get out of the car and look for an Avis representative. I feel really, really stupid by this time. I am a geek. I am a designer & an engineer. I decide there is no way I am asking someone how this thing works. I will figure it out if it kills me. So back in the car. 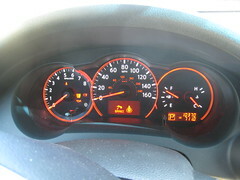 Finally I notice (by peering over the steering wheel slightly) some items lit up in the center of the dash! First icon. Foot on a brake. 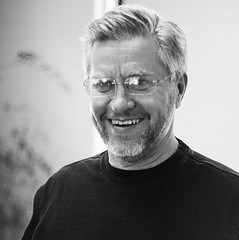 Second icon. What is that? Hmmm... the gas pedal is next to the brake. So that must mean madly press the gas as I press the brake while pushing the Start/Stop button. Success! Although I almost flooded the engine. It turns out the second icon means "push the button". Maybe if it had been a finger on the "button" I would have gotten the sequence: foot on brake, finger on button. 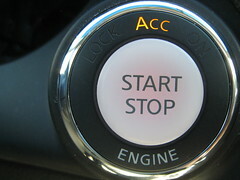 Ok, so now that I know the magic sequence, keyless ignition is cool. In my everyday experience it is much better than keyed ignition. 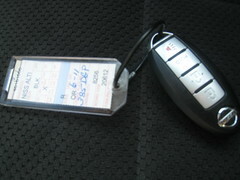 Just hop in the car with "key" in my pocket, put my foot on the brake and push the button -- awesome! Normally a car salesman would have happily explained it to me. But in the Avis parking garage I had no car manual nor anyone explaining the process. My experience figuring it out was very frustrating. Yet the everyday experience was not. Why was this? 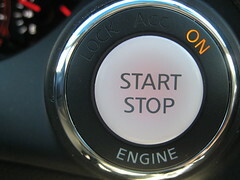 Since I was left to figure out this sequence on my own I had to rely on what I already knew about about starting cars. And it had nothing to do with putting your foot on the brake. This you see is not an intuitive interface. It is what Alan Cooper calls an idiomatic interface. In Cooper's book, About Face 3 he describes three types of interfaces: instinctive, intuitive and idiomatic (pp 273-275). An example of an instinctive interface is when you can't keep your eyes off of the dancing cowboys in the ubiquitous mortgage ads. Your brain is hard-wired for attention processing. An intuitive interface is one that utilizes the brains ability to do a mental comparison between familiar experiences and a new one. An example might be guessing what the trash can icon on a desktop does since you already understand a real world trash can. Putting items in it would throw them away. But getting items into the trash can may not be something you could intuit without being shown drag and drop. This is the last type -- idiomatic. Idiomatic interfaces are what make up most user interfaces. Scroll bars, nested folders, radio buttons, drag and drop are not instinctive or immediately intuitive. Instead you have to learn how to use them (yes there is a gray line between intuitive & idiomatic). In the original Mac the shortcut for ejecting a disk was to drag it to the trashcan. Not intuitive and not instinctive, but idiomatic. Like learning the idiom "beat around the bush" once it is learned it is easy to use in common speech. Ejecting a disk by dragging to the trash can was a nice shortcut (before the mac had right click menus). Once I was shown this idiom I did not forget it. 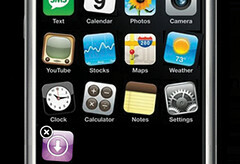 Another example of an idiomatic interface is the iPhone's ability to move items around. You hold your finger down for a second or so on the icons on the home screen. They get jiggly. Then you can drag them around. Totally not intuitive. But idiomatic. Once learned it is easy to do. So back to the keyless ignition. This is an example of an idiomatic interface. Not intuitive. Why the brake + the button? Why not just the button? I am guessing this keeps the kiddos from starting the car up. Also guessing the seat requires someone sitting in it before the brake + button would even work -- all safety features. But even though it was not intuitive it was learn-able. And as with all good idiomatic interfaces once I learned it the interface was simple. This is very true about most interfaces (or objects). Coming from a non-western culture, I had heck of time figuring out how to use a coffee maker. I almost bought an Altima back in 2007, I was impressed by that smooth transmission technology. Interesting! Most, if not all, modern cars (ever since the suspect unintended acceleration problems with Audis) require the brake pedal to be depressed to start the engine. If you just turn the key without depressing the brake pedal nothing happens. My guess is this how your car at home functions. 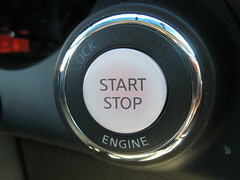 So, what's interesting is that the physical idiom change from manual key to push button forced you to re-learn the relationships and processes. 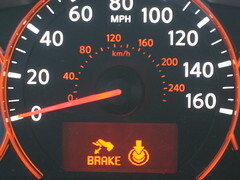 When I learned to drive (circa 2004) I was taught to always press the brake before igniting the engine. Apparently older cars (of my parent's youth) had a tendency to lurch forward suddenly if they were left in gear. Thus braking during startup prevented parking lot fender benders. I've always followed the custom though I doubt modern automatic transmissions experience this problem. I rented a Toyota Prius, which had no keyed metal, but the whole fob had to be inserted into the dash (like the crystals in Superman) before the starter button worked. I've liked my cars before, but I haven't LOVED one until I got our 2007 Altima (same form factor/features as the 2009). However, the one "interaction irritation" that I have with it is the temperature readout is in the dashboard, not in the rearview mirror as it is in our Pathfinder. 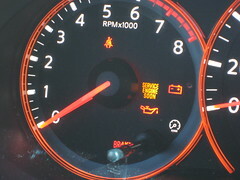 I like to have one of the fuel efficiency meters going most of the time, I also like to know the external temperature... So I have to keep flipping back and forth while driving, which is not only cumbersome but also a bit dangerous in my opinion. I have to mentally count the six panels while repeatedly pressing the cycle-through button so I can get to/from the displays I want while keeping my eyes on the road. Seems like having the temp gauge on the mirror makes more sense (since they put the compass on there anyway!). Otherwise, it's been a really awesome ride from a usability standpoint. One more observation: it seems to me that the moonroof also an idomatic interaction: one rocker button to slide open/close and also to tilt up/down. Once you learn it it's fine and makes sense, but you have to play with it a while to get it at first. 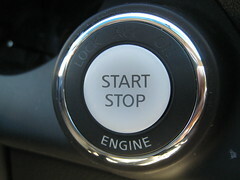 1) there was never anything wrong with the standard key ignition model. 2) If you thought the Altima experience sucked, try starting up a Prius. Sometimes people create solutions to a problem that never really existed, and along the way created a new problem. The kinetic honda - an automatic geared scooter in India - is something like this. You press the brake with one hand, twist the accelerator with the other hand, and press a button with your thumb. I only had to learn it once, and once I'd figured it out, I could start the bike with just one hand. Squeeze, twist and press with the right hand.